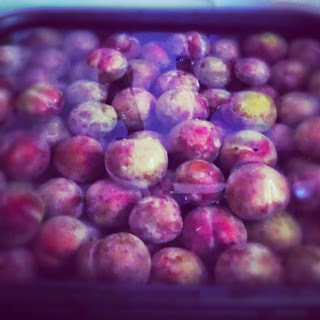 Our plums were ready much earlier this year. We had a harvest about 3 to 4 times the size as last year. Look at some pictures of these beauties! I am really excited about the amount of plums. 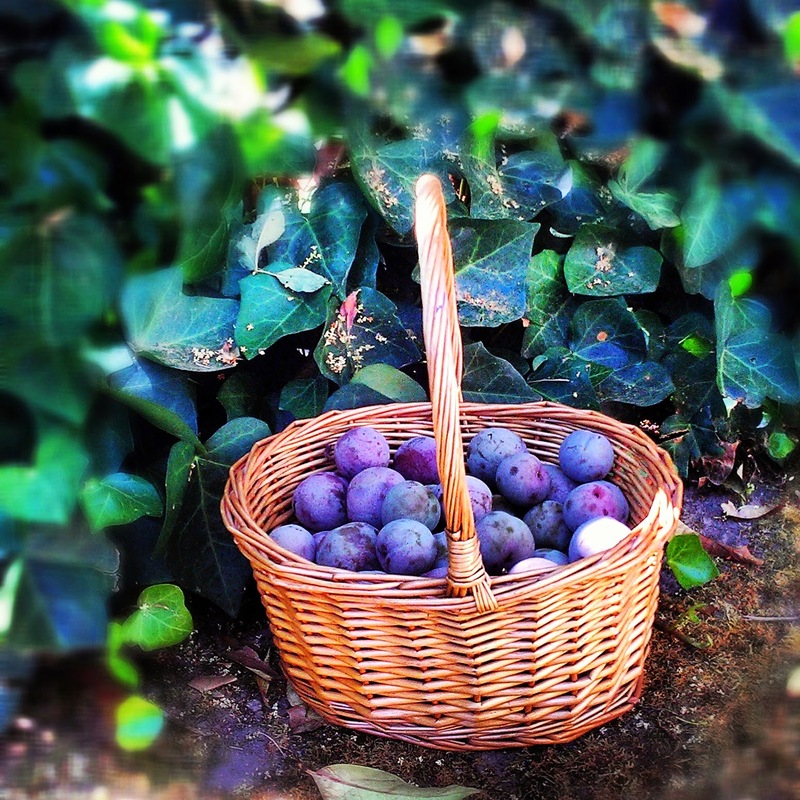 I prayed that our harvest would be much larger so that I could make a plum jam or butter and still have enough to give out to the people that I love. There are still more plums up there. 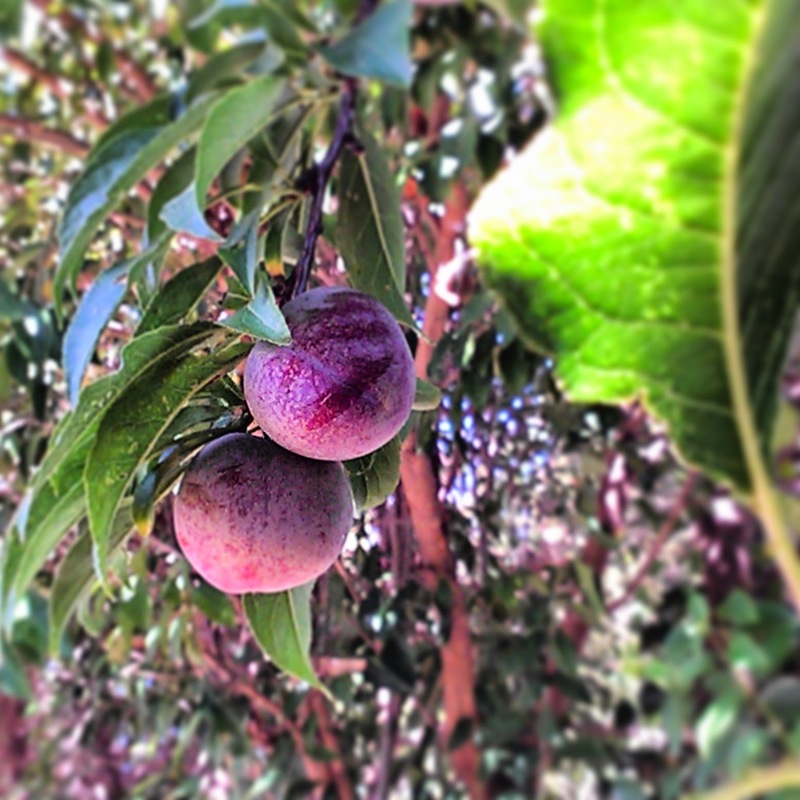 When my daughter and I picked the first ripe ones this year we were surprised to find how sweet and juicy they were. Growing your own food has unlimited benefits and pleasures. It feels good to pick the plums and think of all the delicious things you could make with them. I had our family over on our first harvest day. 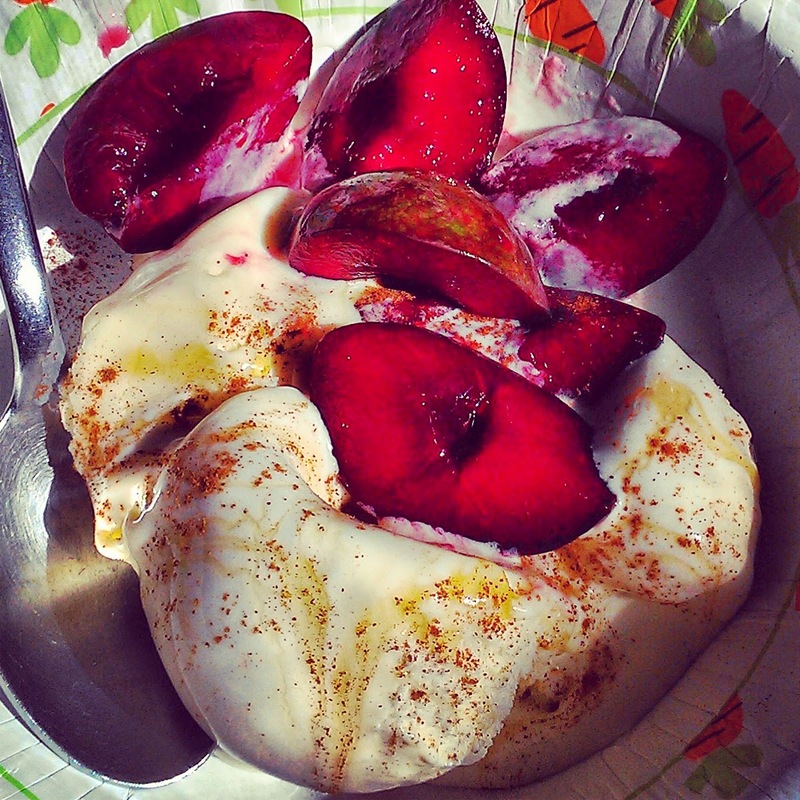 I decided to pit them and quarter them to serve over vanilla ice cream with local honey and cinnamon(pictured below). This turned out to be an indulgent treat for all of us. A memorable way to celebrate our fist harvest for 2014. 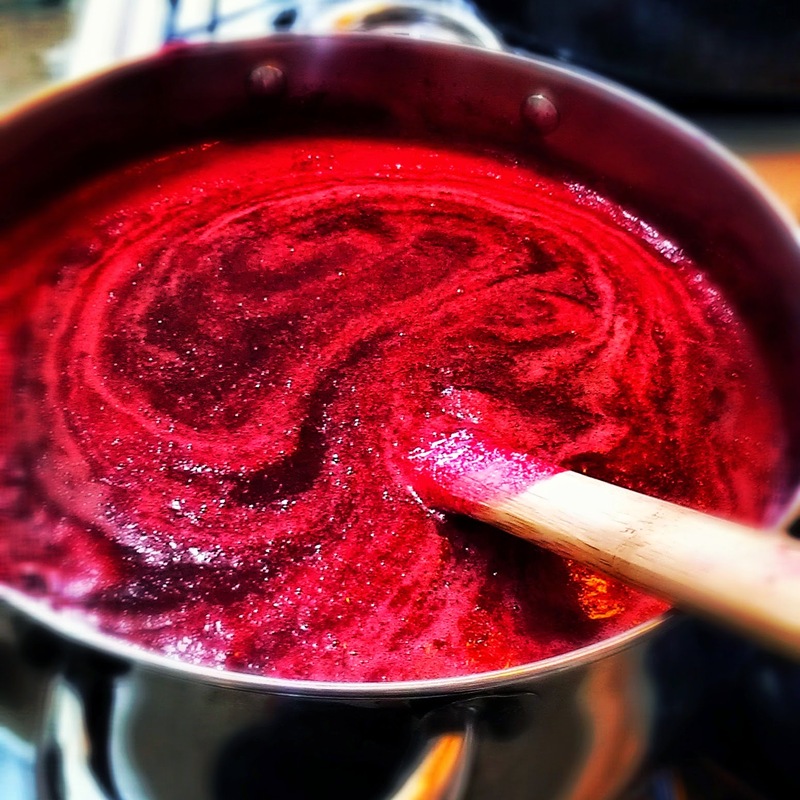 The next step for me was to find a good jam or butter recipe. After all these plums were my new babies and I wanted them to shine. I wanted to make them sing on the palette! I decided to use a plum butter recipe that I found on Martha Stewart. Here is the link..... http://www.marthastewart.com/355859/plum-butter (Below are some pictures from the process of making the butter.) 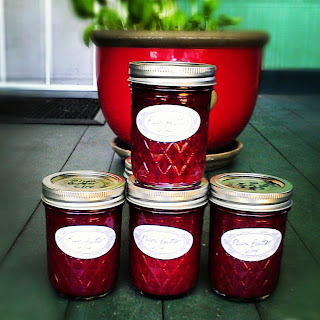 I made a simple plum jam for last years harvest but it wasn't very interesting in layers of flavor. So this year I wanted to find something more complex. This recipe looked the most promising. My experience with Martha Stewart recipes has never failed me in the past. This recipe was the most promising. I had a lot of fun canning on my own this year. This is something I have always wanted to do. I knew if I took my time I could really do it and enjoy the process. 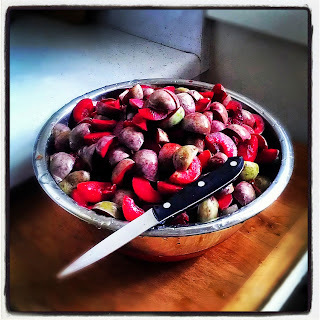 I doubled the recipe and ended up piting and quartering 7 lbs of plums from our tree, with more plums to spare. I filled a whole flat of ball crystal jam jars! God is gracious,and good! Now I am anxious to try out an interesting strawberry jam recipe because they are in season. I think I may try making something with an herb or with balsamic. Maybe several different kinds and can them at the same time.